27-Sep-2006 -- This is the 15th confluence visit on a bicycle trip from China to Central Asia. The story starts from 32°N 107°E. After the visit of 46°N 80°E two days earlier, I decided to go for this confluence which is 20 km straight south from the city of Almaty. As Elionora preferred to visit the museums in Almaty, I started this trip alone from the city centre by bicycle at 7 a.m. at an altitude of 750 m. One hour later I reached the city limits at an elevation of 1200 m and continued the uphill ride until I reached the end of the road at 2030 m (due to a missing bridge). I abandoned my bike and started to hike along a steep former cable railway. Later, I learned that I could have ridden my bike almost up to the confluence, because there actually was a track that avoided the broken bridge. At 2500 m altitude I reached the beautiful Almatiskoe Lake with its colourful water and gorgeous landscapes around it. From here it was another 6 km to the confluence. I continued the hike on a little track that later crosses the Ozerney Pass to Kyrgyzstan. At a distance of 800 m I left the track and climbed a little glacial debris hill. The confluence is just below the debris zone on the edge of a little valley. It was a great sunny day that allowed long-distance views. 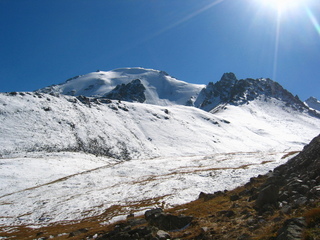 From the confluence one can enjoy views to some of the nearby 4000 m peaks. I made a panorama view picture from the confluence, but I wasn’t able to see my pictures for exactly 3 years. Why have the pictures come with a delay of 3 years? The memory flash card of my camera broke while touring in Kyrgyzstan. Several attempts to recover the data failed, until, I came across this website. It appeared to be professional, so I submitted the card one more time. A week later, they delivered all the pictures to me! The way back was quick. I ran back to the bike (4:10 pm) and coasted back down to the city, where I met Eleonora at 5:22 pm. Time at the CP: 1:50 pa.m. Vegetation: wilted flowers, hydrophilic grass, 50% snow coverage. The borderline with Kyrgyzstan is passing about 1.65 km south of the Confluence.